Best paragliding in the world?! Yes, you read it right. 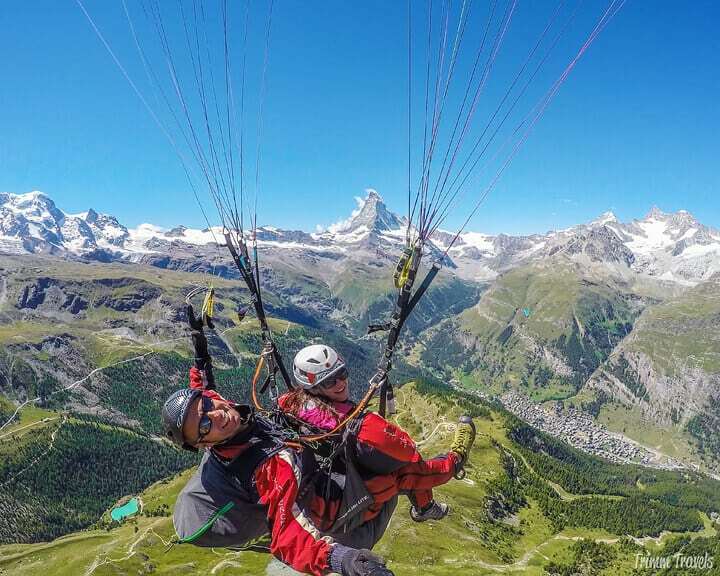 Top travel bloggers and I shared in this article the best paragliding spots in the world for an unforgettable paragliding experience. 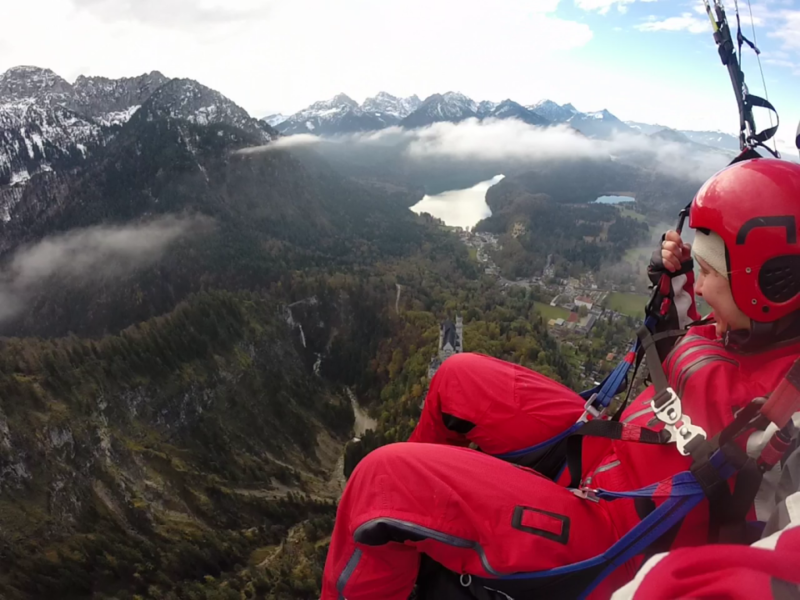 From paragliding in Nepal, to paragliding in Turkey, to paragliding in Colombia, and even paragliding over the famous castle Neuschwanstein in Germany. All of these include adventure, stunning landscapes and experiences that will last a lifetime. 7 Bonus: Where Did Dreams in Heels Go Paragliding? 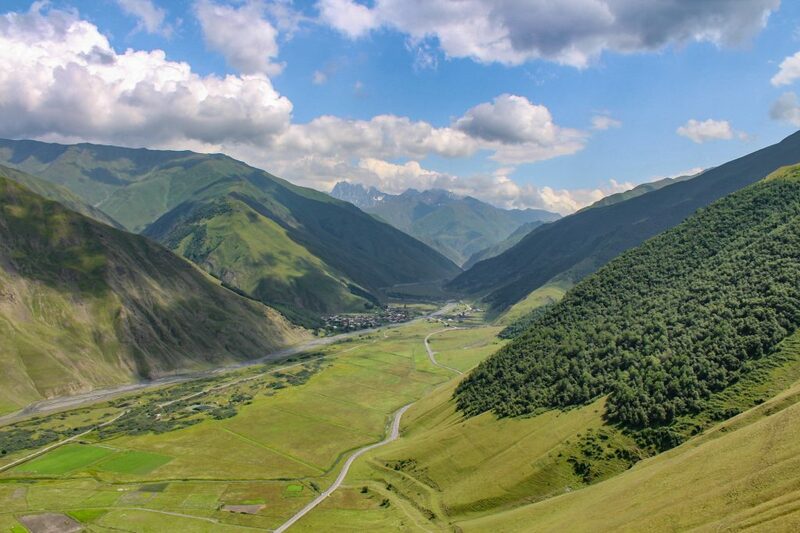 The best thing about paragliding in Kazbegi, Georgia is the altitude! When you start your flight at 3000m above a sea level and go up to 3500/3600m above the sea level in the middle of some of the most spectacular views of the Caucasus Mountains there is no beating that no matter what. It starts with the running of the cliff and finishes with a perfect soft landing, while the time in between is filled with smooth flying while admiring green peaks of the Caucasus and little Georgian villages and valleys. Bir Billing is a spiritual retreat and the paragliding ranch of India situated in the extreme corners of Himachal Pradesh. Billing is located at a distance of around 20 kms from Bir and it is renowned for paragliding activities in the country. There are other attractions like Buddhist monasteries, Tibetan cuisines and Hindu temples within the region. 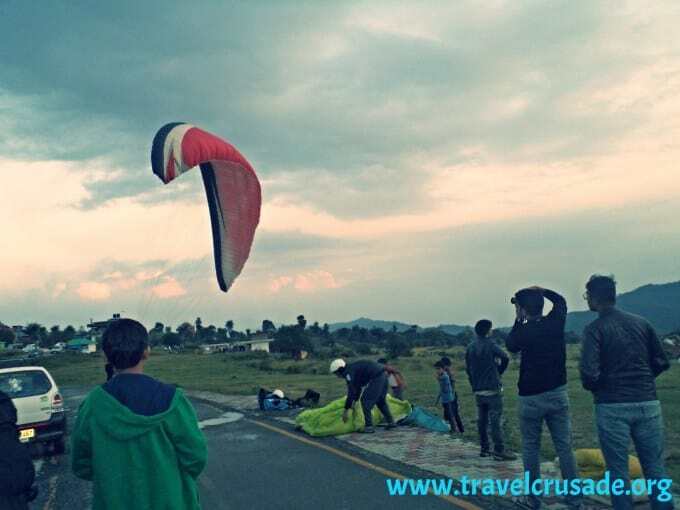 Travelers come from all corners of the world to pay a tribute to this wonderful paragliding venue in the country during different seasons of the year. The paragliding venue is located within Bir and due to rainfall in the area, activities gets ceased during afternoon. Tourists are asked to do paragliding for around half an hour and they are mostly allowed to roam within the region. A guide also remains with them for aid and support and in case of any emergency.It is not however recommended for kids below 5 years.The cost is minimal and travelers can get a chance to witness the beautiful paragliding experience with a few bucks. Due to the presence of Himalayas and a serene landscape,it is worth paying a tribute to this wonderful paragliding venture which is the most renowned and important paragliding avenue in the country. How does it feel like flying over a nine cornered lake? Well, if you have never experienced it the the paragliding grounds of Naukuchiatal awaits you. Situated within an enchanting valley is a small hill station named Naukuchiatal in the Indian state of Uttarakhand. Naukuchiatal provides ample of opportunities for those who wish to fly like bird or try some water sports. Initially I was very afraid to go for it hence chose to go for a smaller flight of about 5 minutes but once in air the feeling was beyond amazing as the cool breeze swiftly caresses my face and the green vistas came as a visual treat. If you fly at the time of sunset then the hues of sky alleviates the whole experience. Going for a longer flight of 20-30 minutes shows you around the top view of different lakes and is strongly recommended if your pocket allows for it. Being easily approachable via rail and road makes Naukuchiatal even more attractive for the tourist looking for a serene, peaceful yet adventurous getaway. South Korea is a great place to go paragliding. The country is beautiful all year around and offers different scenery depending on the season. 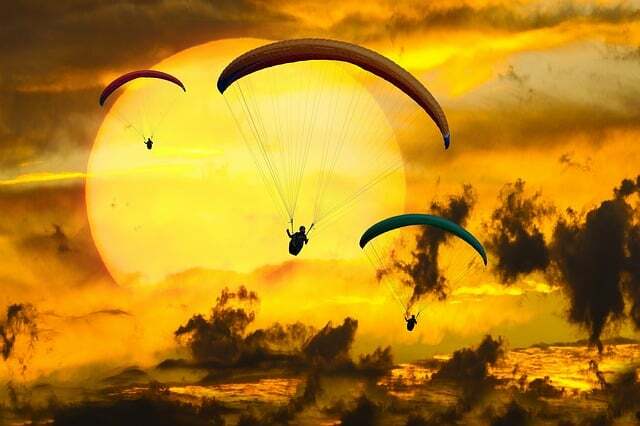 It is easy to go on a day trip from Seoul or Busan to enjoy paragliding in the country side. As Korea is a very mountainous country, there are many paragliding clubs located all over the country. Coming from Seoul, there are 2 recommended clubs to go for, Danyang or Yangpyeong. Yangpyeong paragliding club became famous as it was featured in a Korean tv show ‘We Got Married’. It is located only 1 hour away from Seoul, which makes it the perfect day trip. 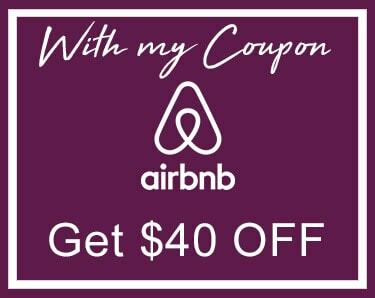 When making a reservation, you’ll have the option to pick from 4 different packages. The basic flight, photography flight, updraft flight and team flight. You’ll be accompanied with a licence professional as you will be flying in tandem. The best time to go paragliding is during the cherry blossom season early April or when the leaves of the forest start to turn golden, end of October, early November. Winter is stunning, but as temperatures in Korea can reach -20°, it is not recommended to go paragliding in winter. 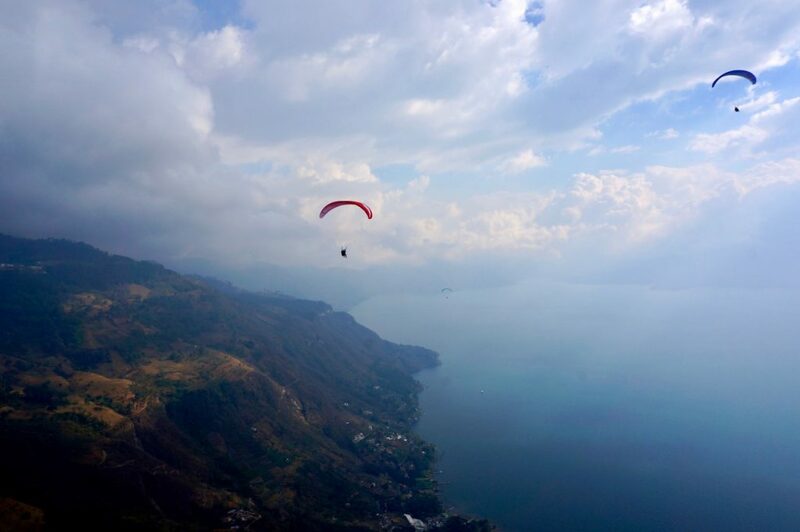 Guatemala’s Lake Atitlan makes for an incredible place to go paragliding! The stunning location of this lake up in Guatemala’s highlands provides for an ultra-scenic landscape to fly over. As one of Guatemala’s largest lakes, Lago Atitlan itself is gorgeous to gaze down upon while floating in and out of the clouds. Yet the volcanoes that dramatically sprout up around the lake’s shore adds to the amazing scenery. And it’s all best viewed while hanging from a parachute, of course! The looming mountains surrounding Lake Atitlan give a natural high point to soar off of, allowing for lengthy flight times. 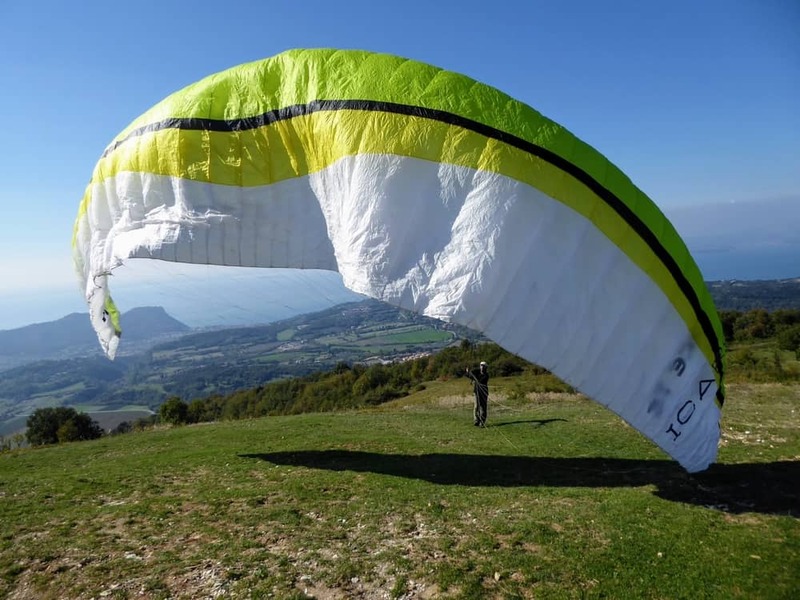 Thermals occurring throughout the lake further aid long paragliding flights. The birds eye view of the lake, volcanoes, villages, and river valleys are spectacular. We even found the paragliding ride to be calming and relaxing, rather than a fear-inducing flight. That is, until our paragliding guides gave us the option to do some fun maneuvering while soaring close to the volcanic terrain. What a thrill! We did our paragliding over Lake Atitlan with Real World Paragliding in the village of Panajachel. They have a good track record for safety, professional, and are very enthusiastic in what they do. 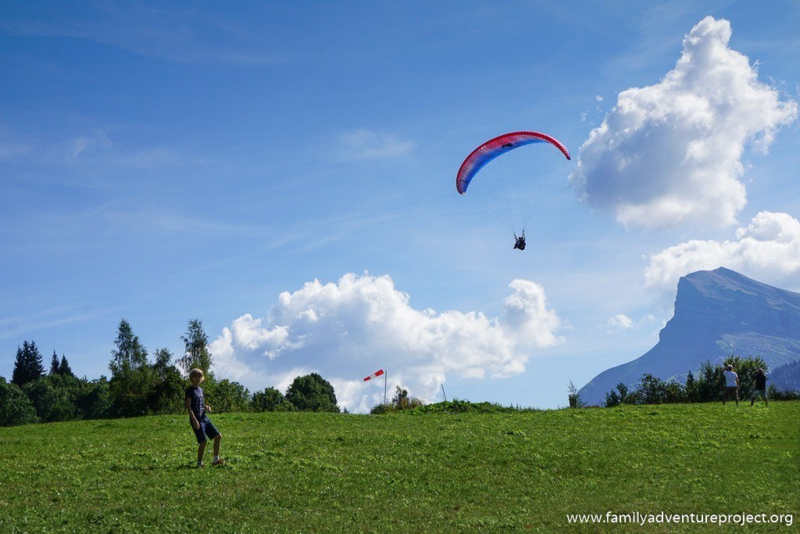 Children as young as six can do a tandem dive at Parapente Planete paragliding school in Les Carroz d’Arâches. Situated on a plateau at 1140 m height in the French Alps, les CARROZ is a pretty village a short drive from the bigger ski resort of Flaine. You can do a jump all year round and while I had a short taster session you can pay for longer experiences; it is even possible to fly in from the ski towns of Chamonix and Samoëns. The big draw is the view of the Mont Blanc mountain range. Strapped to my experience pilot I sailed over pine forest, and spun over picnicking families, dipping towards vibrant blue lakes and soaring up and away over swimming pools. “Want to jump in?” my instructor joked. I politely declined. Even if I fancied a swim, I was enjoying myself too much in the air. Like most adrenaline junkies, when I travel, I love to do extreme sports and activities. But one item sat on my bucket list for years, Paragliding. It wasn’t that I was afraid, but instead that I wanted the ideal location, not just ANY paragliding. For example, I knew it needed to be in the mountains, where I could feel like I was soaring above the peaks. So, when we were visiting the famous Neuschwanstein Castle at the foothills of the Alps in Bavaria, Germany, I just KNEW that was the one! As my feet continued to pedal, despite having left the ground, I gasped in the cold air as I looked down below and saw the majestic castle. What is a looming and impressive fortress at ground level, was just a small building from above the clouds. Needless to say, this was one birthday I was never going to forget. Paragliding is not an experience I have had before so when I heard that they did this at Lake Garda, Italy, I was keen to try it. I had checked out the reviews for Yeti Extreme and they all seemed good, so I got in touch. I met them nearby and we headed off to Mount Belpo in their van before taking the final climb to the take-off point. Their instructors were great and easily put the butterflies in my tummy at ease. After a briefing, the next thing I know is that we were running off the side of the mountain and floating high like a bird over Lake Garda. This was such an amazing experience, and I felt so safe with the instructor. I even got a certificate and a video of my flight. This video is extra special to me, as I had control over the GoPro the entire flight meaning, I got on video, all the parts that were important to me rather than what my instructor thought I should see. I would highly recommend taking flight over Lake Garda. Imagine a bird’s eye view where on one side you see Nis, one of the oldest cities in the Balkans and on the other side Jelašnica Gorge, a stunning natural feature. Below you unfolds a coloured tapestry of agricultural fields. The wind transports you with 40 kilometres per hour. Due to the current, you go higher and higher. 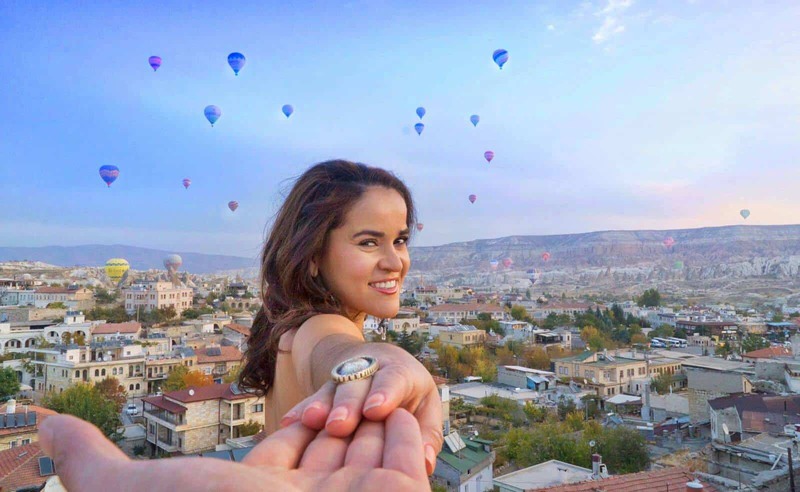 This is what it feels like to go paragliding in Nis. Your flight starts near Niška Banja, which is approximately fifteen minutes drive from Niš. If you don’t have your own transport, take a taxi from your hotel. They are cheap. Paragliding Grunf is a local company organising the flights. The instructors are professionals, who also speak excellent English and most importantly they will ensure a soft landing when paragliding in tandem. Alternatively, contact the local tourist office to make arrangements. In the summer temperatures on the ground can easily go as high as 30° Celcius, but in the air, it feels remarkably fresh. So dress accordingly. You should always plan your flight with plenty of room to change timings as due to adverse weather conditions, flights might be cancelled at last notice. If that happens, don’t despair as the surroundings of Niš are ideal not just for paragliding but for many outdoor activities, like rafting, climbing and hiking. 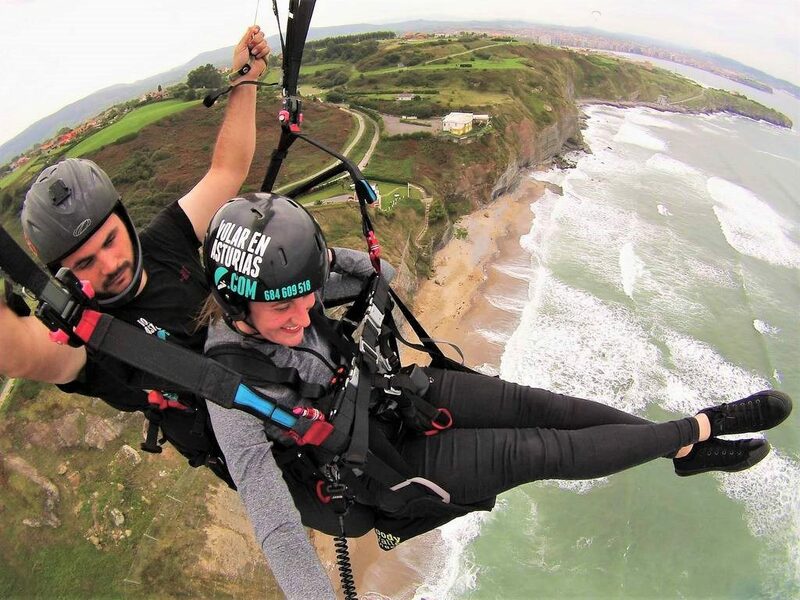 My first – and last to date, because I have not tried again – time paragliding was exciting, short for the ‘visual’ me and way too long for the part that gets dizzy and wants to vomit, unique, and just overall a great experience.I chose Gijón, a city off the Atlantic coast of Asturias, in the north of Spain and it didn’t disappoint as, on top of paragliding, there are so many great things to do in Gijon. Whether because the paragliding itself is awe-inspiring and I wanted to try it for a long time, or because the area they chose to launch was right next to the coast overlooking some dreamy cliffs; truth is that I recommend this destination to everyone that wants to get started with paragliding.Just remember to leave the cameras and mobiles on the ground and simply enjoy. Or sooner than you think, you will get sick as I did! The mountain scenery of the Bernese Oberland in central Switzerland is breathtaking even from the ground, but when viewed from above while gliding through the air over snow-capped summits, it’s nothing short of spectacular. 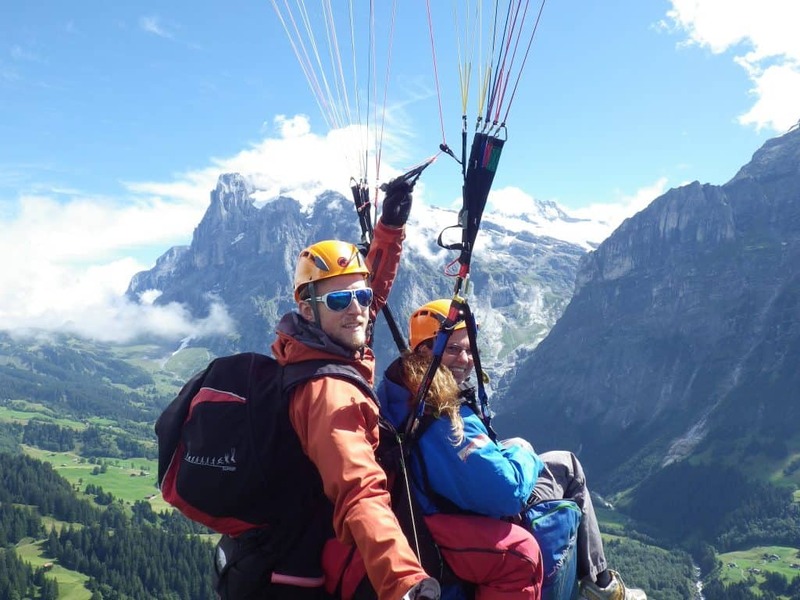 Paragliding-Jungfrau is a well-established local company that offers paragliding trips starting in a few different locations around Grindelwald and Lauterbrunnen. My husband purchased an extra long tandem flight for me as a birthday gift, which starts from a place called First. This is a minor summit on the slopes of the Schwarzhorn that can be reached by cable car from Grindelwald. While it’s possible to fly from other points even in the winter, the extra long flights from First only run from May to September. On this flight, the guide who was riding tandem with me used the upcurrant to let us fly higher and further. I definitely recommend the extra long flight if you can swing it! I thought it would be scary to run off the side of a mountain, but actually, it was really easy. All I had to do was take a few steps, and suddenly the wind picked us up and we were off before I knew it. Then all I had to do was sit back, relax and enjoy the views. Cap off your experience with an overnight stay in the Eiger Selfness Hotel in Grindelwald and enjoy dinner at their cozy restaurant Barry’s. The menu includes several options for vegan and vegetarian visitors to Switzerland. I was so excited to go paragliding for the first time. Where did I choose for my very first experience? Zermatt, Switzerland with the Matterhorn, of course! I couldn’t imagine a more picturesque background than the Swiss Alps and it didn’t disappoint! I went paragliding in the summertime, but you can paraglide in Zermatt year-round and the wintertime is also very beautiful with its blanket of snow. My guide from Fly Zermatt was fantastic and totally put my fears of running off a cliff at 10,100 feet at ease. The result was a 20-minute dream experience that I will remember for the rest of my life! What I learned was that I love paragliding and now looking back, this shouldn’t have been surprising since I love to fly as well as zipline. I feel so connected to myself, nature and God during all of these aerial activities. I did some of my best thinking during those 20 magical minutes and it became an activity that I now want to do everywhere I go! I highly recommend paragliding in Zermatt, Switzerland. Meeting the Matterhorn for the first time is awesome, but meeting with the Matterhorn on its level is a whole different ballgame…there are no words really! If you’re passing through Cordoba in Argentina then consider heading out to La Cumbre for the paragliding. It’s awesome fun. After prodding from my partner, I found a travel agency near our hotel who helped make the arrangements. After taking the bus to La Cumbre from Cordoba, I was met by my paragliding pilot/partner and taken to a large cliff. The cliff is next to a large thermal making takeoffs straightforward. Unlike other “extreme sports” like activities I’ve done there was little structure. While I felt safe with a quality harness and the right gear there wasn’t any safety talk or briefing or even a proper wind sock. When the strip of material attached to a stick was blowing the right way I was told to run off the cliff. It sounds scary but the thermal got us well before the edge and lifted us up. We got high in the air – over 300m high – and circled around on the thermal for 30 minutes before my pilot decided it was time to land. The views up there were fantastic and it felt like a cross between floating and flying. It was incredibly peaceful. Of all the “extreme” things I’ve done paragliding is perhaps the best and La Cumbre was a great (and cheap!) place to do it. During our 4 month journey around South America, we made the bold decision to try paragliding just outside La Paz in Bolivia. Both my partner and I have never done anything as crazy as paragliding, so this was a scary decision for both of us. However, I’m so glad that this became our first experience of this high adrenaline activity! La Paz is already incredibly high up, and has an altitude of more than 3,600 metres. So, once you start paragliding, you reach incredible altitudes! We got to enjoy breathtaking views of the surrounding Andes mountains, as we kept soaring higher and higher. On the way back down, I did get a sudden rush of sickness, but that’s probably because we reached heights of over 4000 metres. What’s so great about paragliding in La Paz is that it’s so cheap as well. It cost us just $50 each, and our guides were some of the friendliest people we met on our travels. It also included lunch. So if you find yourself in Bolivia, looking for a way to get the blood pumping, then I highly recommend giving paragliding a go. Iquique, Chile, in the arid, sandy Atacama Desert bordering Peru is one of the top paragliding destinations in the world. Because of the consistent wind direction novice (P1) pilots come here to learn and P4 pilots come for the amazing thermals. Thermaling over mountainsides and giant sand dunes is spectacular. And, flights finish with lovely landings on one of the 3 local beaches. Each morning from our accommodation in Iquique we drove up the mountain to Alto Hospicio and launched off the cliff side. If we flew left and gained enough altitude in the thermals (follow the birds!) we could then head out further and make it over the high voltage power lines. When ready to land we flew over the city all the way to the beach. Then it’s off for some ice cream and rest. Each evening a short drive down the coast from Iquique is Palo Buque where we kited uphill from sea level to launch into the air. Situated between San Gil, a small village that is a backpacker favorite, and the large city of Bucaramanga, the Chicamocha Canyon and surrounding National Park make a great addition to your Colombia itinerary (especially if you’re an adventure-seeker!). At it’s deepest point, the Chicamocha Canyon measures 2,000 meters (6,600 feet) from bottom to top, making it the second deepest canyon of its kind on earth. 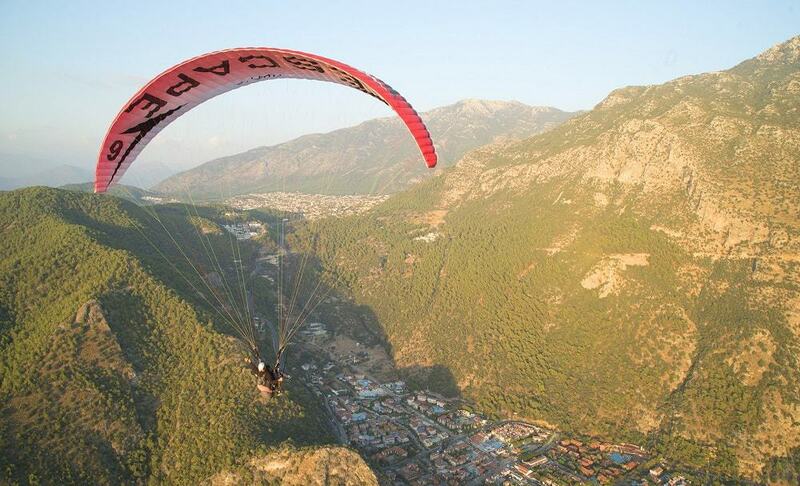 This area is a great place for hiking, caving, mountain biking, and you guessed it – paragliding! The Chicamocha Canyon is one of the top paragliding spots in the world due to its unique combination of little rain and great thermals, an updraft that paragliders use to fly. There isn’t anything like the feeling of running off the edge of the cliff and getting swept up in a thermal gust of air that carries you over this jaw-dropping landscape. You’ll see the Chicamocha River carving its way through the canyon’s floor, and you’ll have unbelievable views that go on for miles to the horizon. Your tandem guide will navigate you over forests and past some farmsteads where you can look down and see people below. 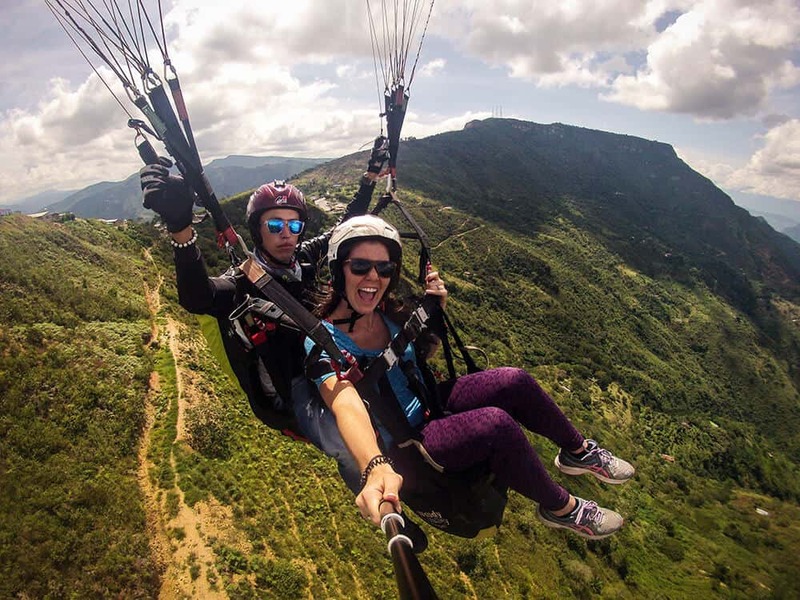 The paragliding flights in the Chicamocha Canyon last between 15 – 30 minutes depending on the conditions, and you can get as high as 1,000 meters. Just be sure to let your pilot know if you have a weak stomach, as they like to take you for a spin! It’s an incredible rush but can leave you nauseous. Most guides even carry a ‘barf bag” for this purpose. Unlike many paragliding spots around the world where you take off and land in different places, the excellent thermals in this canyon allow you to actually return to the exact same spot you started. 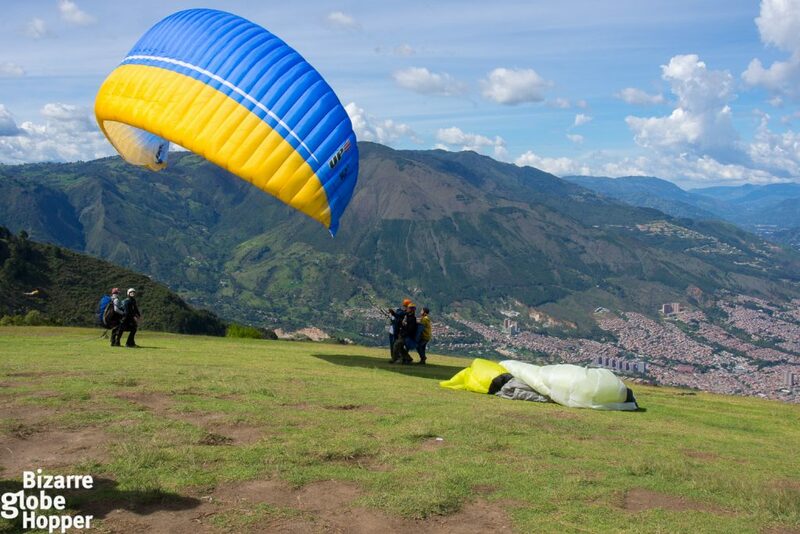 The city of Medellin is surrounded by the Andes mountains, making it a perfect paragliding spot. While 20 years ago Medellin was dubbed as the murder capital of the world, now “the City of Eternal Spring” has become a tourist hot spot with no shortage of adrenaline-fueled things to do. Paragliding upon the red roofs Medellin was the highlight of our one-month tour in Colombia. To start your adventure, take a meandering taxi or bus trip to the village of San Felix, high on the hills. The elevation of San Felix is 2378 meters, 1000 meters higher than the center of Medellin, so the climate is slightly cooler. The view towards the city is breathtaking already from the hillside. Just a couple of minutes after the take-off you’ll be free-flying upon Aburra Valley and the colorful barrios of Medellin. Before ending your airborne adventure, you’ll get a chance to admire nearby countryside, waving goodbyes to goats, cows, and distant mountaintops. Landing is safe thanks massive landing area, which can cater to several paragliders at the same time. We were lucky to fly with several birds. After sightseeing, we were allowed to try some paragliding acro tricks, such as spinning and spirals. Though there was some turbulence, we felt safe at all times. The tiny, mountainous town of San Gil in Colombia offers so much more than an authentic Colombian experience. It is the adventure capital of the nation and people come from near and far to bungee jump, mountain bike, rappel, raft and most importantly paraglide. Paragliding in San Gil was one of the best experiences and the main draw card for our visit to this small town. 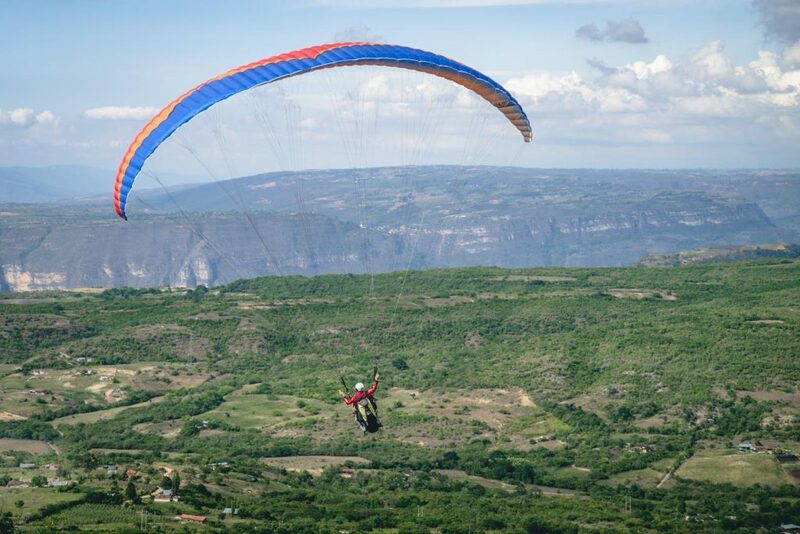 Paraglide operators in San Gil are plentiful, some even have over 20 years of experience under their belt, and they typically offer two paragliding flight options. The first option is to fly over the Curiti Valley. These flights are suitable for both adults and kids and flights are shorter and fly at a much lower altitude than their counterpart. 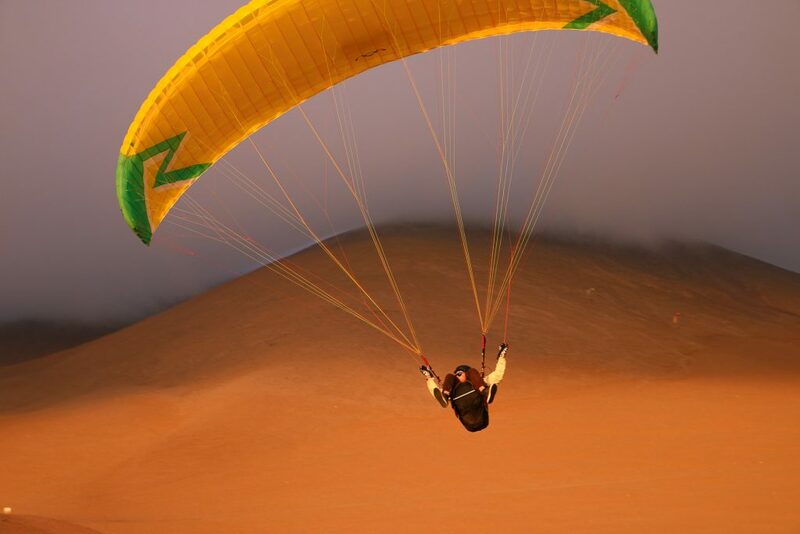 You’ll find locals paragliding over the Curiti Valley any day of the week! The second option is to paraglide over the Chicamocha Canyon. These flights are longer and a bit more technical as visitors can fly at a height of 1,000 meters. But regardless of which location participants decide to paraglide over the views are absolutely stunning. Expect to see incredible rolling green and rust colors hills of the valley and canyon. And if you’re into a little bit more adventurous. You might be able to convince your paraglide instructor to endeavor a 360 degree motion mid-flight. 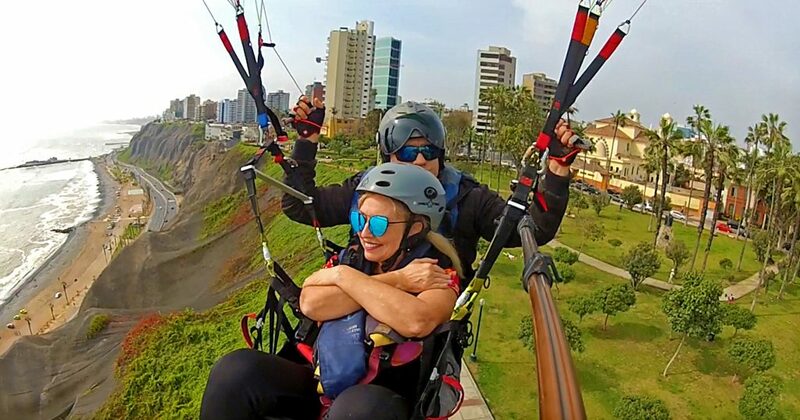 The best views of Lima come from under the paraglide canopy, 500 feet in altitude, during summer, when the city is not blanketed in fog. The most adrenaline-inducing part of the experience is running off the cliff near Parque del Amor, strapped tightly to an experienced paraglide pilot. Paragliding over Miraflores, we passed a variety of sights. After first hugging the steep cliffs – so close thought I might need to stick out my leg and push off – we gradually rose up with the draft. For the next ten minutes, I was treated to a bird’s eye view of the area. My favorite was the panorama of the shoreline and the deep blue sea. Opposite the ocean, the green cliffs rose up to reveal the gorgeous city landscape, massive Larcomar shopping mall and modern, upscale apartment towers. In the distance, I could see the bohemian district of Barranco with its historic cathedral and quirky street art. I realized it was well past the normal ten minutes dedicated to the flight. Finally my tandem pilot told me the wind had collapsed and we were caught in a downdraft. “We’re going to have to land down there on the beach,” he said, pointing. It looked a long way down. “Don’t let us crash!” I demanded. We slowly drifted to the beach, hit the ground with a thump, and he rolled over me. I was okay, and how many people can say they survived a crash paraglide landing? We are always looking for the next big adventure, or the next activity we can add to our bucket lists. Anything that gets the adrenaline going, or gives you an experience of a lifetime always goes directly to the top. Paragliding is one of those activities that should definitely be high up on your bucket list. If you’re looking for an awesome adrenaline pumping experience, this is it. We think Hawaii is a perfect place for an awesome paragliding experience. The views of the Pacific Ocean, and the islands is so beautiful, that you’ll enjoy a relaxing and enjoyable flight high above the island. Paragliding is available on several of Hawaii’s Islands, and we think Oahu is a great choice. You’ll be able to soar above the ocean below, and find some awesome sea life. Try spotting some sea turtles below. When you go Paragliding, you will be paired with a professional paraglider, so you can just enjoy the ride. 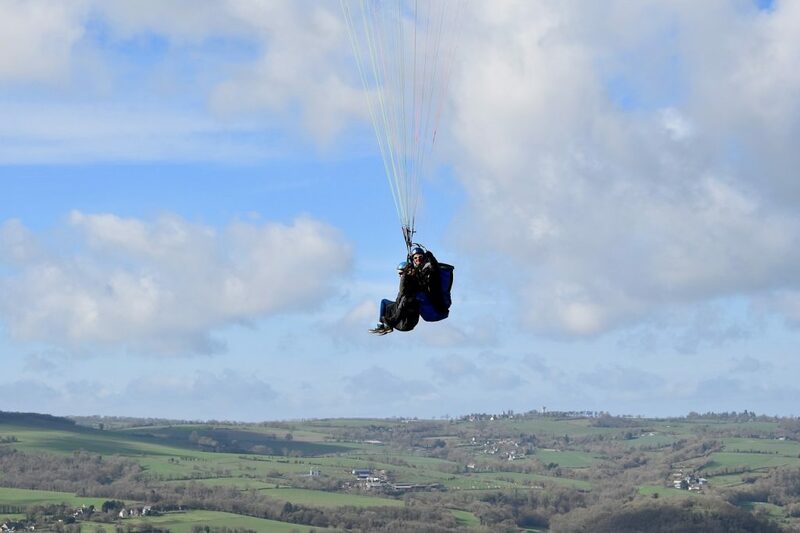 Each ride is a tandem paraglide experience, so there’s no worries about having experience or having to know how to fly one. Add paragliding to your bucket list for an unforgettable experience, and flying in Hawaii will make it that much better! The Palouse region of Washington state is a beautiful place to paraglide and hang glide. The “Palouse” is an area of rolling hills and agricultural lands in the southeast part of Washington. Some have even called this the “Tuscany of America”. In the middle of the hills is a single mountain of 1,110 meters, and this mountain is part of Steptoe Butte State Park. Tourists and paragliders can drive all the way top of Steptoe Butte for incredible views. 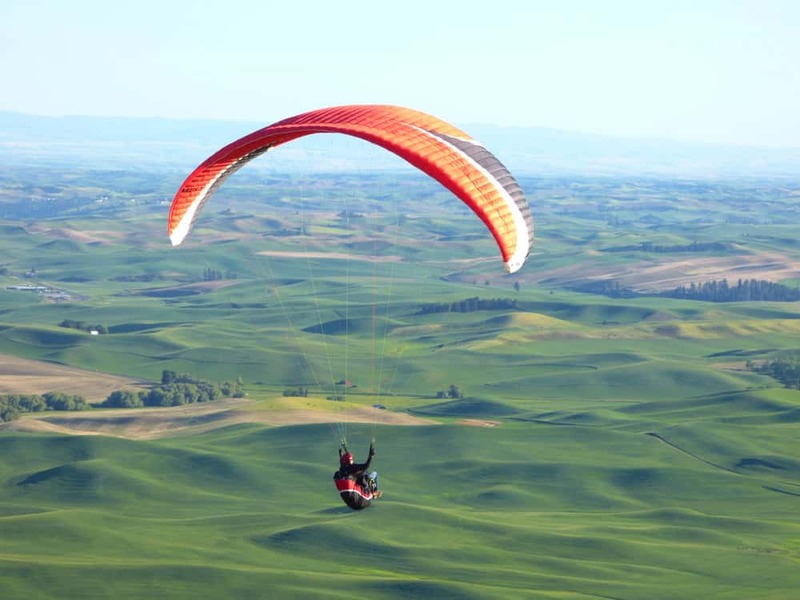 There are ideal wind conditions for paragliding due to the shape of the Steptoe Butte above the rolling hills. The views change throughout the season – in May and June the hills are incredibly green. By the fall, the hills are aglow in gold as the wheat is ready to be harvested. Visitors must have a Discover Pass or state park day pass to access the launch site. Bonus: Where Did Dreams in Heels Go Paragliding? One of the most unique adventures suggested for 2018 is Paragliding over the Blue Lagoon, in Oludeniz Beach, in Turkey. 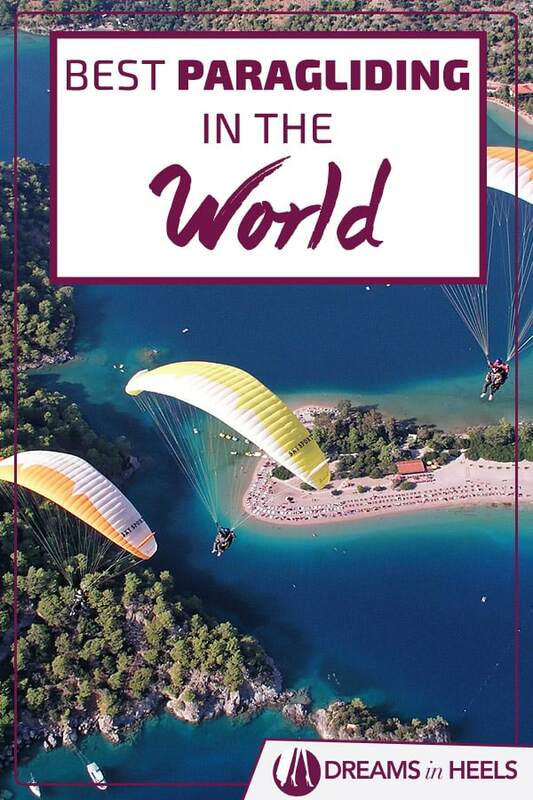 They’re known for having the best paragliding in Turkey. You’ll get your adrenaline pumping while also experiencing the totally breathtaking panorama! Here’s the process: They prepare you for what’s expected (to ensure your safety), then a van takes you up the babadag mountains. Once the experts (certified instructors) test the wind conditions and approve all’s well, then your tandem instructor gets you ready and voila, you are flying! I felt like a feather drifting between the clouds. Make sure to admire the sky, the mountains and the prettiest blue water. Believe it or not, it’s a super relaxing, fun and totally worthwhile experience! The only thing missing for me, were some tapas and wine to better enjoy the view. Note: If you are adventurous enough to ask for tricks like me, it was even more amazing. A total natural energizer which will leave you wanting more! Warning: You may want to do it all over again and again and again! Have you ever been paragliding before? If yes, tell us all about it in the comments (include where and your experience). If no, then tell us, would you dare to consider it? 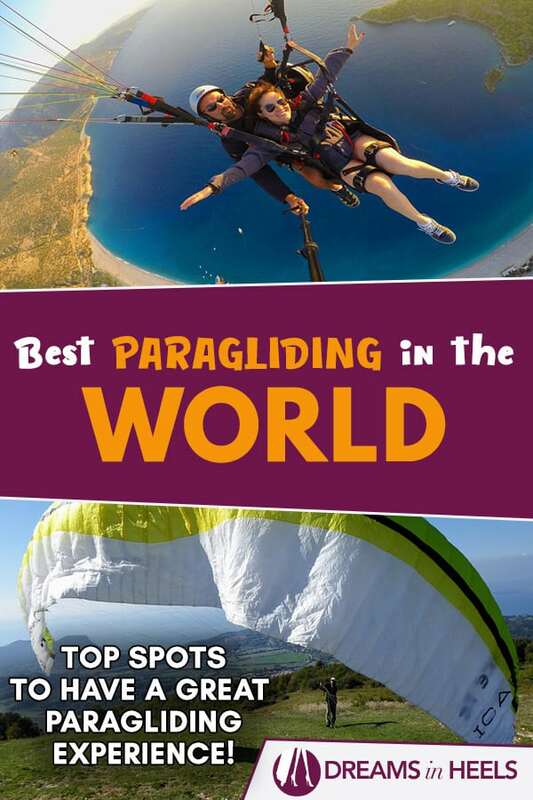 In this list we covered some of the best paragliding in the world. Do you have any other suggestions? Let us know. Thank you for commenting. I am so glad to hear. Paragliding is just amazing!